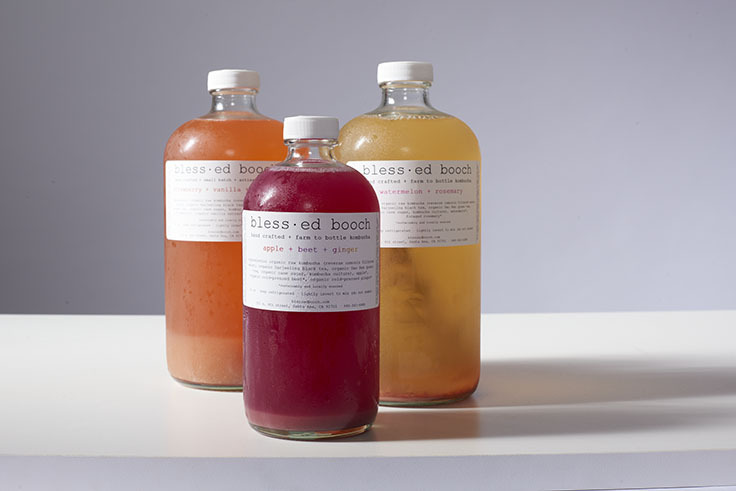 Blessed Booch infuses its kombucha with a multitude of medicinal herbs to enchance its health benefits and flavors. We love the sweet strawberry, vanilla, and cardamom. So, we asked founder Christy Rumbaugh how the Laguna Beach-based company gots its start. When did you decide to start your own kombucha company? I started home brewing once the woman I bought it from at the Laguna Beach Farmers Market closed her business and sold her cultures. I started sharing my brew with family and friends, and received an overwhelmingly positive response. I had always wanted to start my own business in the culinary world, and kombucha just seemed to be calling my name. How did you want to differentiate from other kombucha brands already on the market? Our kombucha is “farm to bottle.” We only source our produce from small local farms who are “better than organic,” as we say, because they use old world methods and are not on a commercial level. We only source our fresh produce from small local farms. We have various sources for our tea and herbs, but they are all organic and fair trade. The cane sugar we use is organic as well. We view our booch as medicine and infuse each individual bottle by hand. We are in the kitchen brewing 1-2 times per week. The brewing process is quite simple. You brew tea, add cane sugar, and then add the kombucha culture which is a symbiotic colony of bacteria and yeast. Then, you let it sit out in room temperature and wait for the magic to happen! Coming up with the flavors is the best part! Perusing the farmers markets and tasting what is in season is very inspirational. We work with a lot of herbs, roots, flowers and superfoods to create flavors that have more medicinal intention rather than just a good tasting flavor combination. Kombucha, or ‘booch’ for short, is revitalizing, energizing, immunizing, thirst quenching, detoxifying and protective. The ‘booch’ is a life force, and a testament to the true healing powers of nature. Healthy equals happy, and therefore the booch is blessed [bles.id]. What really sets our kombucha apart is the addition of intention and energy. We create a concentrated structured water using healing crystals, the sun, moon, stars, positive intentions and affirmations to charge the water with a high level of energy. We also use crystal singing bowls in our fermentation chambers which exude a healing matrix of grounding, peaceful energy. Together these techniques are intended to create high vibrations of healing energy to promote optimal cellular function and an overall blissful sensation. We bless our booch with love and magic, and therefore it is also blessed [blest]! The business is based out of Laguna Beach, and our kitchen space is in Santa Ana. $7 to $16, 16 and 32 ounces. At Laguna Beach Farmers Market on Saturdays, Laguna Niguel Farmers Market on Sundays, and here.